Link to Shenna Bellows for Senate website. 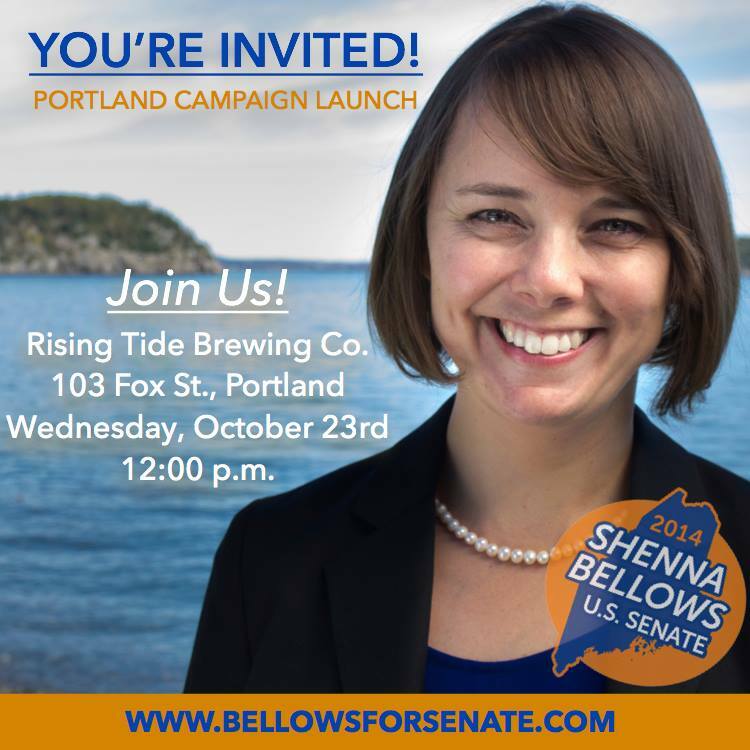 Maine Democrat U.S. Senate candidate Shenna Bellows kicked off the start of her official campaign yesterday with events in Ellsworth, Portland, Lewiston and finally Eliot. Today she is in Presque Isle and Bangor; her week concludes with events in Topsham, Rockland and Skowhegan, as Bellows plans to speak in every Maine county this first week of campaigning with a target goal of stops in all of Maine’s cities and towns over the next year. The photos below were taken at the Portland event, held at Rising Tide Brewing Company- a local Maine business hit by the recent federal government shutdown. Good morning. My name is Shenna Bellows and I am running for United States Senate because I believe we need more courage and honesty in Washington. But we have an opportunity for change. To put government back to work for everyone and not just the few. To get our country back on the right track. And that work starts here and it starts today. 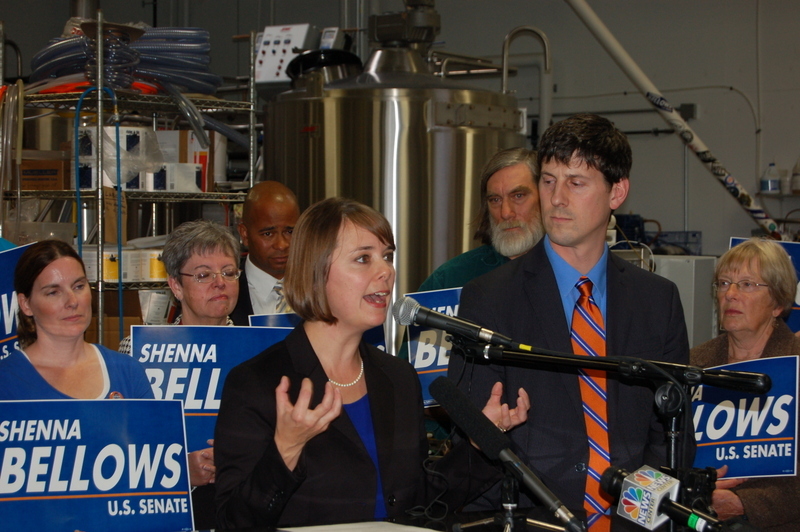 Maine U.S. Senate Democratic candidate Shenna Bellows addresses supporters and media at Portland’s Rising Tide Brewing Company, as her husband Brandon Baldwin looks on. As some of you may know, I was married on September 21. Brandon and I made the decision to spend our lives together in 2010. But we had made a vow that we wouldn’t get married until every loving committed couple could do the same, including our gay and lesbian friends and family members could be legally married. Last November, Maine made history when our state became the first to pass the freedom to marry at the ballot box. It was an amazing day made even better when the first couples started to wed last winter. But it wasn’t until June, when the Supreme Court overturned the outrageously named Defense of Marriage Act, which discriminated against gay and lesbian couples. I don’t think they knew it at the time, but when the Supreme Court justices said DOMA was unconstitutional, they were also opening the door for Brandon and I to tie the knot. We were engaged on a trip to the Potato Blossom Festival in Aroostook County. We were married at our home in Manchester. We honeymooned in Rockland. And though we’re still traveling around Maine, I think the honeymoon is over. Being part of the leadership team of Mainers United for Marriage for seven years was to date one of the greatest honors of my life. We stood up for equality and freedom, and we created positive change one conversation and one person at a time. And we did it together. I share this story because it is fundamental to who I am, why I am running and what I would like to see change in Washington. First, who I am. I am a principled leader who has a proven track record of standing up for people’s rights. I was the Executive Director of the American Civil Liberties Union of Maine, a non-profit organization. Our mission was to defend the Constitution and the Bill of Rights. I am proud of the work I did there – defending the right to vote, protecting privacy and fighting for freedom of speech and equality. Through that work, I had the opportunity to be involved on several statewide campaigns where I gained valuable experience that I plan to put to work over the next year. I grew up in Hancock. My mom, Janice Colson, is here this morning. She just got off the night shift at the hospital. She is the bravest person I know. When I was a kid, we grew our own food, organically. I don’t think we were trendsetters. Truth is, I don’t think we could afford pesticides and fertilizers. One day, mom was pounding fence posts in the backyard. She smashed her thumb. It was terrifying to us kids seeing mom hurt. We didn’t have a telephone so there was only one thing to do. Calm as could be, she just put the three of us in the car and drove herself to the emergency room. 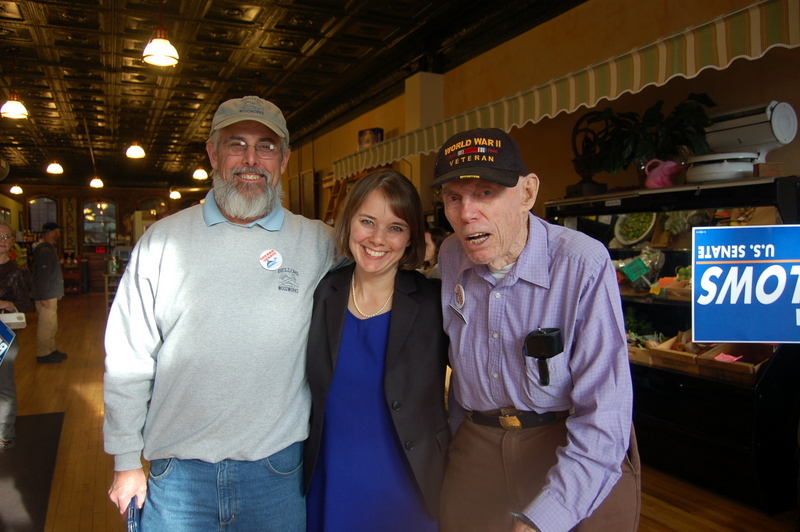 Shenna with her father Dexter Bellows and grandfather Bill Bellows at Forage Market in Lewiston. My dad, Dexter Bellows, is here this morning too. He’s a carpenter, and he and his wife Bethany Reynolds worked hard to make this day happen today. I get my courage and my work ethic from my parents. Thirty-three years ago, my dad started his own carpentry business, Bellows Woodworks. My mom stayed home with me, my brother and my sister. When I was in the fifth grade, she went back to work at the local greenhouse, Surry Gardens, and we were able to afford electricity. It takes a lot of courage to start your own business, especially when you’re trying to take care of a young family. My father took a risk. His story is the story of countless other entrepreneurs. And it’s the story of our country and what gives America the reputation of being the land of opportunity. My mom worked in the greenhouse for over 20 years. At age 49, she too took a risk by going back to school, first with adult education courses at Ellsworth, and then at the University of Maine where she obtained a degree in nursing. My parents’ courage and work ethic have inspired me my entire life to work hard and to try to make the world a better place. I have worked throughout my career to do my part to change the world. From my time as a volunteer in the Peace Corps in Panama, to service as an AmeriCorps VISTA volunteer in Nashville to standing up for the Constitution and the Bill of Rights at the ACLU. I understand what it’s like to work for a living. I’ve waited tables, worked retail, worked at the local lobster pound and was even a Subway sandwich artist. When I was in college, my job was in the recycling program, which meant essentially that I collected the trash each week. My community and education gave me other opportunities along the way too – the opportunity to go to Middlebury College, to work as a research assistant at the Mount Desert Island Biological Laboratory and then as an assistant to an economics professor who writes leading economics textbooks. These experiences shaped who I am today. I am unafraid of hard work, and I am inspired to make the world a better place. I’m running for United States Senate because I believe we need more courage and honesty in Washington. The sequester, the shutdown and the default debacle made his argument for him. When senators congratulate themselves for doing their jobs – for doing what decent people do all the time and talk through challenges – something is deeply wrong in Washington. It took three weeks and cost our country billions of dollars because grown men and women couldn’t put aside their ideology and do the peoples’ business. 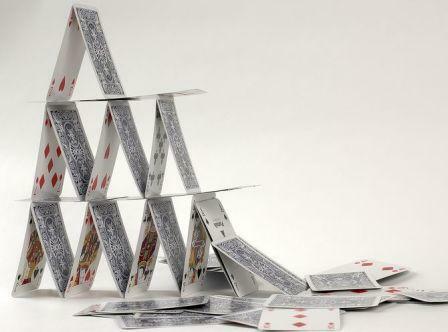 When Congress acts merely to kick the can down the road three months, so that we will continue to lurch from one economic crisis to another, something is deeply wrong in Washington. The sequester and the shutdown are unforgiveable. When Head Start and Meals on Wheels programs are cut back while members of Congress pay themselves hundreds of thousands of dollars in salary and benefits, something is deeply wrong in Washington. When workers’ pensions are underfunded or frozen but government pensions for members of Congress are not, something is deeply wrong in Washington. Our democracy is too important for good people to stay on the sidelines. Our democracy demands a full and fair debate in this race about our priorities. The future of our democracy requires that good people with good ideas participate and that at all levels we debate in a civil and respectful way the solutions that will move our country forward. Look, I understand that the road ahead in this campaign will be hard. Daughters of carpenters don’t usually run for the United States Senate. Races like this can cost millions of dollars, which is why we have a Congress of millionaires instead of a Congress of working people. I understand the power of the incumbency, but I am undaunted and promise to run a strong campaign that will challenge the status quo and give voters a real choice next November. And if elected to the United States Senate, I can assure you: I will work hard to advance meaningful campaign finance reform so that more sons and daughters of carpenters and working people can represent us in Washington. In addition to courage and honesty, we need more people in Washington who will listen respectfully to people with different points of view and work together toward meaningful solutions. No two people can ever agree 100% of the time. Even my husband and I don’t agree on everything. While we may not agree, you will always understand where I stand, and I promise that I will come to any policy debate with an open mind and treat everyone with respect. Earlier this year, I organized a broad coalition that included Democrats, Republicans, Independents and Greens to pass a groundbreaking law that protects cell phone privacy. While we might disagree on other issues, we all came together to fight against the dangers posed by government intrusion into our personal lives. Our opposition was intense, bipartisan and included some of my close friends, but we were able to disagree respectfully. After months of hard work, Maine was one of two states in the country to pass cell phone privacy protections in the wake of the NSA spying abuses, and we were one of just five successful veto override votes when the Governor vetoed the legislation. I am proud of my work in Augusta to build broad coalitions across party lines to pass legislation that has made Maine a leader and a model for the rest of the country when it comes to civil liberties. This brings me to what I would like to see change in Washington and what I would do if elected to be Maine’s next Senator. In the last two decades, we have experienced a constitutional crisis, an economic crisis and an environmental crisis that threaten our country’s future. What unites us as a country are our shared values set forth in the Constitution and the Bill of Rights. Politicians in Washington have trampled on the Constitution over the last decade. Washington has created a constitutional crisis. My first job at the ACLU was as a “Safe and Free” organizer working back in 2003 to educate the public and organize opposition to the Patriot Act. I think it’s terrible that only one Senator, Russ Feingold of Wisconsin, voted no to the Patriot Act. It’s concerning that only Rand Paul is taking to the floor to filibuster on drones. Abuses of power like the Patriot Act, REAL ID, NSA spying, and domestic drone surveillance threaten our democracy. We need to repeal the Patriot Act and REAL ID. We need to stop the NSA and the FBI from wasting their time and taxpayer dollars spying on ordinary Americans through our cell phones and email. We need to place limits on drones. A reporter asked me last week why should we care if we have nothing to hide. The question suggests that we need to sacrifice our freedoms for security. We do not have to sacrifice our fundamental freedoms to be safe. When the government spies on its own people, we, the people, lose trust in our government. We can restore trust and a sense of community by restoring our constitutional freedoms. In addition to a constitutional crisis, we have an economic crisis, manufactured by politicians in Washington who seek short-term solutions rather than visionary change. When I graduated from college with a degree in international politics and economics, I had more than $30,000 in student loans. It took me 10 years to pay off my loans, but I was lucky: I was able to get a good job after graduation. I met a woman a couple of weeks ago who told me with anger and sadness that her college-educated son and his wife are living with her at home because they can only find part-time work. Another friend laughingly told me that perhaps his college-educated daughter would work for my campaign for free: he is supporting her financially right now because the only work she can find in her field of study is an unpaid internship. Young people in this state are graduating with record levels of student loan debt, and they can’t find jobs. Not only has unemployment in Maine doubled since 2000 from 3.5% to 7.7% in 2012, but unemployment for young people ages 20 to 24 is in the double digits at 12.3%, up from 6.7% in 2000. We need to invest in our young people and in the next economy. We need to stop spending billions of dollars on a surveillance industrial complex we can’t afford and start investing in entrepreneurs. We can’t afford to be the world’s policeman anymore. We need to stop propping up big businesses that are too big to fail and start investing in local economies. We need to eliminate the sweet-heart deals that protect large corporations and stop writing new rules that block entry for small entrepreneurs and farmers. When I think about Maine’s economy, it’s those small entrepreneurs and farmers who are critical to our success. Young people are staying in or returning to Maine to farm in record numbers. The local food and economy movement – built in our communities, not in Washington, is thriving. We can learn from this model and bring rural innovations to the rest of the country. Politicians in Washington have failed to be forward thinking in their approach to the economy, so our communities here have picked up the pieces and thrived where Washington has failed. We need to bring this fresh energy and entrepreneurial approach to our federal economic policy debates. The local approach is not only economically sustainable but environmentally sustainable as well. In the last two decades, politicians in Washington have wrought an environmental crisis that threatens Maine’s economic future. Anyone who gardens, farms or fishes can tell you that Maine’s climate is warming. Politicians in Washington occasionally talk a good game, but they have done nothing substantive to address the looming environmental crisis. And as we all know, in Maine our economy and our natural environment are fundamentally connected. We have brilliant minds working in the environmental movement here in Maine to protect land for future and also promote and grow local economies. If elected, I will advocate and organize support for a power shift in our approach to energy and environmental policy. We need to have a debate about the best ways forward to fix environmental crisis. The politicians might say that solving climate change is impossible, but it’s too important not to try, and we cannot wait. Today is the beginning of my campaign for the United States Senate. And for the next year, I will work every day to convince voters that we don’t have to be content with the status quo. I know what’s coming and that this won’t be easy. But I’ve seen what good people, working together, can do. Together, we can make a difference. Together, we can change the world. The future starts now. 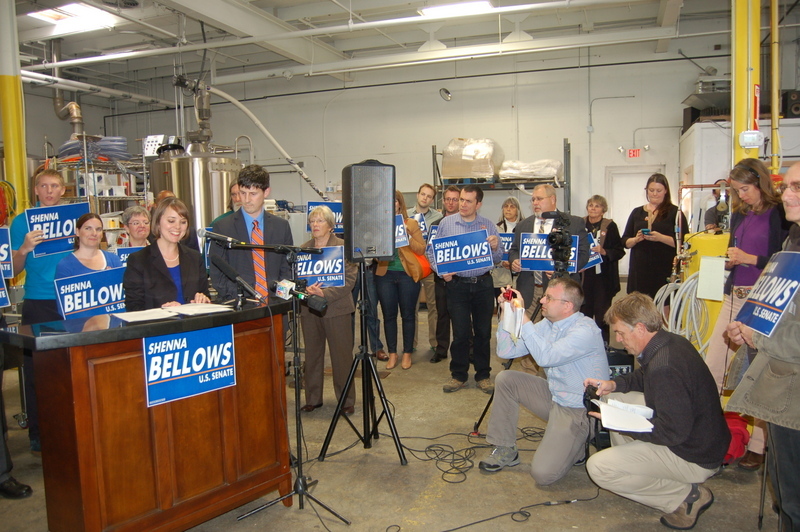 Link to video of her address to supporters in Lewiston. Shenna Bellows, former executive director for ACLU of Maine and recently announced U.S. Senate candidate, is officially kicking off her campaign with multiple stops around the state today. Her day started with a radio interview with The Pulse AM 620’s Don Cookson; she is holding a national call-in media press conference later today as well. Optimus Room at the Regatta Banquet & Conference Center, Eliot Commons on Rte 236. There will be videos and photos updating this post later on. 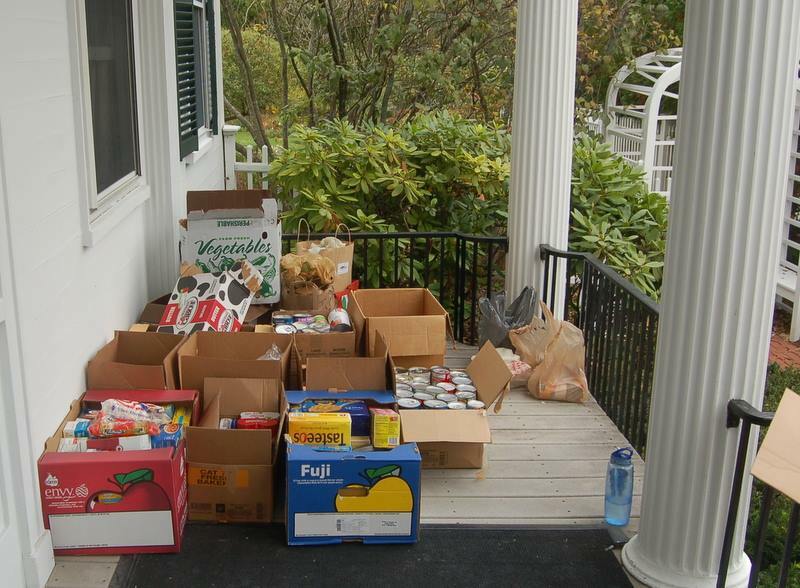 The First Family is hosting the Third Annual Blaine House Food Drive on three consecutive Saturdays during the month of October: Oct. 12, Oct. 19 and Oct. 26 from 10 a.m. to 1 p.m. Mainers will have an opportunity to bring a food donation, receive a tour of the Blaine House led by Governor Paul R. LePage and enjoy light refreshments. LePage has also issued a “Food Drive Challenge” to Maine Chambers of Commerce. In a letter issued to the chambers, the governor encouraged participation in a local food drive throughout the month of October. Chambers that participate will have a chance to host a “Business After Hours” event at the Blaine House. While all offerings are gratefully accepted, there is a great need for infant formula and baby food this year according to First Lady Ann LePage. Gov. 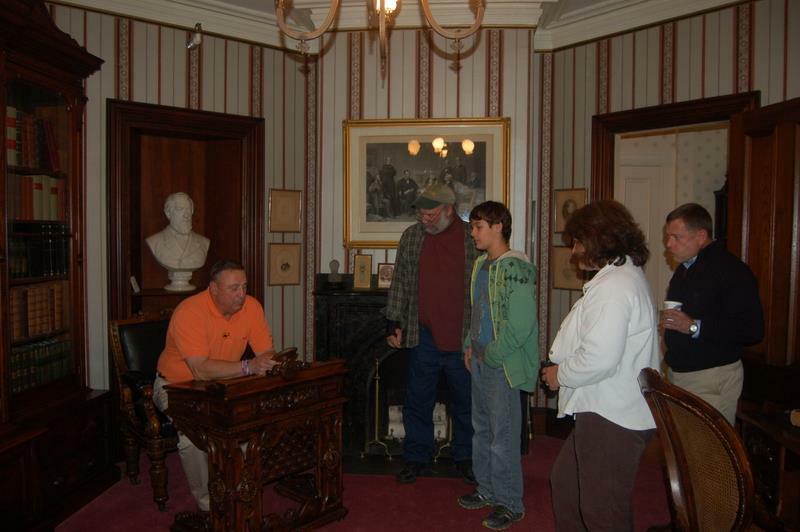 Paul LePage provided history lessons about some of the artifacts found within the Blaine House while leading tours during the open house and in this photo, sat at former Maine Governor James Blaine’s senatorial desk in the Blaine Study. Besides being a Senator, Blaine was Speaker of the House, an 1884 Republican presidential candidate, US Secretary of State and part-owner of the Kennebec Journal. Among the room’s artifacts is a hand-written note on the back of a business card given to Blaine by President Abraham Lincoln dated April 7, 1865. The note was to ensure Blaine safe passage from DC’s City Point to Richmond and back during wartime. Governor LePage took the visitors into another room with a billiards table and spoke of playing a game against a visiting professional player from Finland. 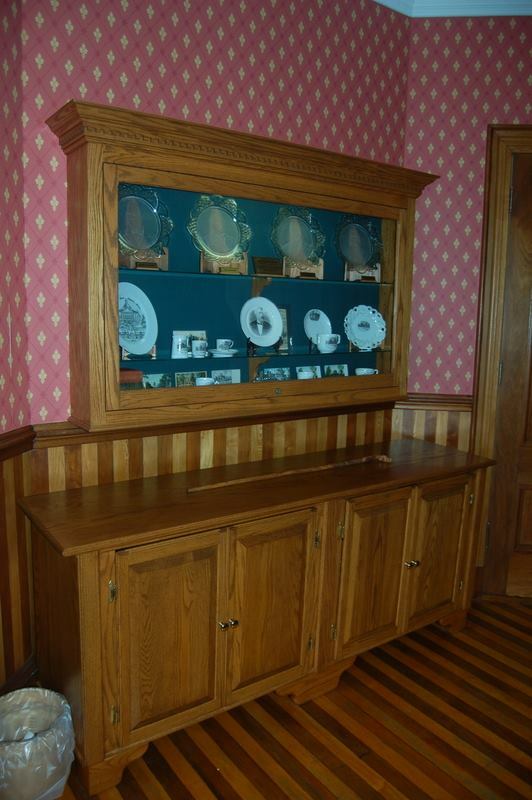 He also showed a rather new piece to the room- a handsome oak sideboard made by LePage himself back in the 1980s. Apparently wood working has been a hobby of his for 35 years. This past Saturday marked the first of the three weekends set aside for the donations. The food, said Lauren LePage, the governor’s daughter and assistant to his chief of staff, will go to the Auburn-based Good Shepherd Food Bank, which will distribute the food where it is most needed statewide. According to both Governor Paul and First Lady Ann LePage, the first open house day saw a much heavier volume of generous donations than in past years with the Governor remarking that in the past, the last day has usually seen the most visitors. DHHS Commissioner Mary Mayhew talks with Rep Dennis Keschl (R-Belgrade) prior to emergency meeting with AFA and HHS committees. 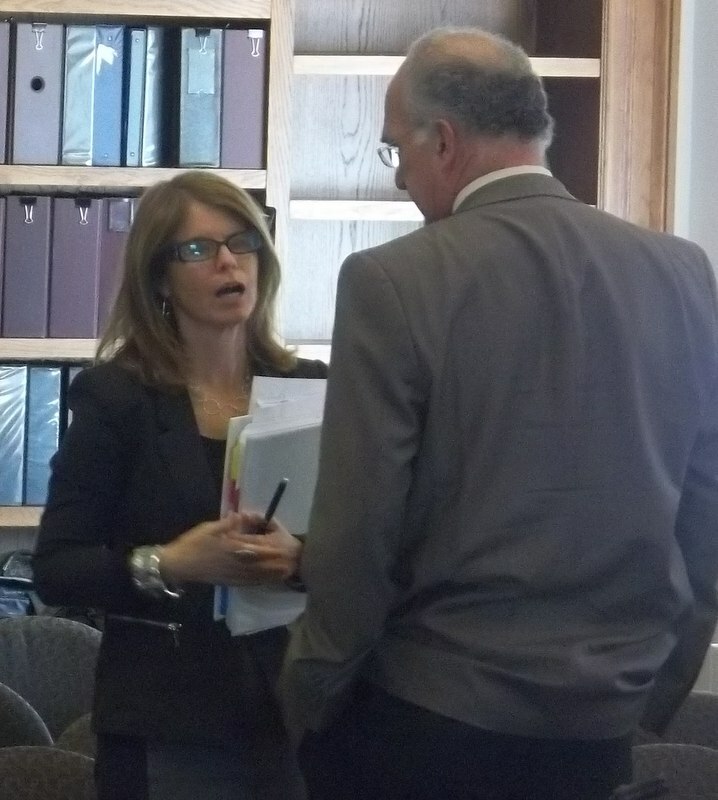 Last Wednesday, Department of Health and Human Services Commissioner Mary Mayhew met with a joint session of the members of the 125th Legislature’s Appropriations and Financial Affairs (AFA) and Health and Human Services (HHS) Committees to discuss what lead to the federal government’s $20 million defunding of Maine’s Riverview Psychiatric Center. According to the feds, the decision to pull funding was based upon the center’s failure to comply with safety standards. The LePage administration received notification on October 2nd (letter dated September 27) of the decision by Centers for Medicaid and Medicare Services (CMS) in a 17 page document which detailed concerns going back to March of this year. In late August, legislators passed emergency measure LD 1515, “An Act To Increase the Availability of Mental Health Services” designed to correct the safety and understaffing issued raised by CMS. In early September, the administration repeatedly assured lawmakers that this measure to expand the Maine State Prison’s mental health unitwould address the federal government’s concerns by reducing the patient load at Riverview. But that was not the case, as CMS terminated its $20 million funding to the psychiatric hospital following an unannounced site visit to the facility in mid-September. It cited ongoing operational, governance, and management deficiencies leading to safety concerns and human rights violations. Here are links to some of the discussions between DHHS Commissioner Mayhew, legal counsel Ken Albert, and various members of the joint committees in their 3 1/2 hour long meeting. Pt 2, Pt 3, Pt 4, Pt 5. “Today’s meeting was about fulfilling the Legislature’s responsibility to work together with the Department in solving critical problems at Riverview. We expected to hear answers about how Riverview got here, why the Legislature was not kept in the loop, and what we must do going forward,” said Senator Dawn Hill of York, the Senate Chair of the Appropriations and Financial Affairs Committee. She continued: “Since March, I believe, the administration has known that funding for Riverview could be in jeopardy, but the Legislature was not informed until August,” Rotundo said. She said lawmakers were then told the bill to expand mental health services at the prison would correct those problems. It is still unclear what the next steps beyond the state applying for recertification will be, if there will be more discussion within the Legislature at this point and how the ongoing federal government shutdown will affect this situation and the funding woes at Riverview. In the days leading up to the federal government shutdown, some of Maine’s Congressional members warned constituents of the approaching crisis, with Rep. Chellie Pingree stating that the September 29 vote by the House GOP linking the budget to removing funding for provisions of the Affordable Care Act was “a reckless and irresponsible move on the part of House Republicans that has taken us one step closer to a government shutdown”. The Congresswoman also set up a web page (“Government Shutdown FAQ”), describing the potential effect on federal agencies and programs, if such a shutdown were to occur. The nation watched and waited, as the efforts for a “clean continuing resolution” or a “CR” went back and forth between the two chambers in DC, with House Republicans refusing to allow a clean CR to come up for a vote in their chamber and the Senate Democrats voting down each and every House-passed CR with ACA-defunding provisions attached to it. Inevitably, America went into its first federal shutdown in seventeen years, as of midnight on October 1, with an estimated 800,000 workers nationwide immediately furloughed. Here in Maine, experts announced that there could be “profound effects on businesses” from a prolonged shutdown for the state. It has now been a week. Let’s examine the numbers of those directly affected here in Maine, shall we? More than 200 federal employees at Acadia National Park in Bar Harbor. 280 immediately furloughed Maine Army National Guardsmen. Scratch that; try 400. 44 more administrative Department of Defense, Veterans and Emergency Management employees in Maine. 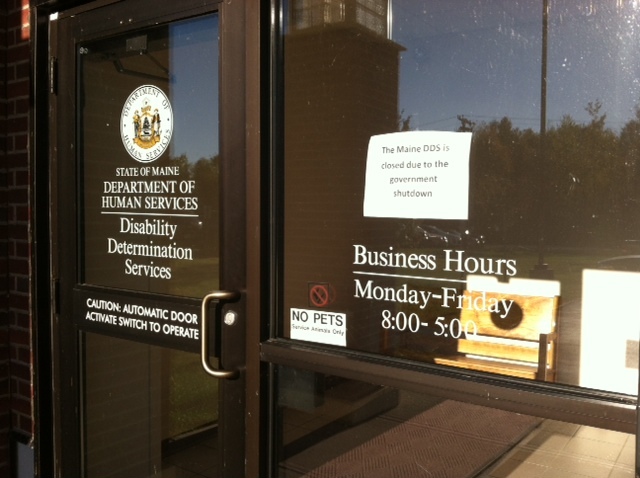 56 SSDI health workers, with 52 of them, being the entire staff of the Disability Determination office in Winthrop. “Thousands” of state employees”, possibly by the end of this week. Potentially more than 500 employees of Defense Finance and Accounting Services in Limestone. 1500 workers at Portsmouth Naval Shipyard were furloughed last week, with some now returning to work. As many as 2800 received furlough notices. In Cutler, 12 workers at the Naval Computer and Telecommunications Station are locked out of their jobs. In Limestone, over 500 workers are still working but may be sent home without pay within days. In Bangor and Portland, Professional Aviation Safety Specialists who inspect the planes we all fly on to ensure safety have been told not to come in, and others that are deemed essential are working without pay. Across the state, OSHA inspectors who keep workplaces safe for all Maine workers are wondering when their next paycheck may be and how they will pay their bills. In Augusta, workers who process veteran benefits at Togus in the VBA will likely be sent home within days. In Kittery, thousands of workers at Portsmouth Naval Shipyard are out of work and more are working but unsure if they will be paid. In Bangor and Portland, Air Traffic Controllers are working without pay. The study, put out by the website WalletHub, says Virginia is the state most affected by the shutdown. Makes sense. Washington, D.C., ranks fourth on the list. Makes sense, too. But that’s just one spot ahead of Maine. Maryland — home to numerous federal offices and federal workers — is sixth, one slot behind Maine. 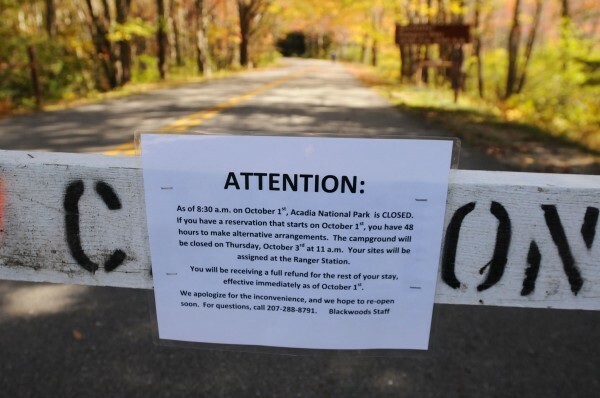 So why does a shutdown hit Maine harder than it hits Maryland? It’s not because Maine is home to a disproportionately high number of furloughed federal employees — though the state has its share. Rather, it’s the state’s high concentration of seniors and veterans, its businesses’ dependence on loans from the U.S. Small Business Administration, and the role real estate plays in the state economy. We now enter Week #2 of the shutdown, with no end in sight. Earlier today, former ACLU of Maine Executive Director Shenna Bellows ended speculation that she would be challenging incumbent Senator Susan Collins by confirming on Twitter that she had sent her initial paperwork to the Federal Elections Commission. Bellows, a Hancock native, has yet to hold public office but considered briefly a run for Congress last year. Prior to her work at the ACLU of Maine, Shenna was the national field organizer at the ACLU in Washington, DC, organizing nationwide civil liberties campaigns including opposition to the Patriot Act, where she built broad coalitions that included librarians and gun owners alike. Shenna’s early career was devoted to economics. She worked as a research associate at Economists Incorporated from 1997 to 1999 before serving in the Peace Corps in Panama as a small-business development volunteer. In Panama, she launched a micro-lending program for artisans, started a Junior Achievement entrepreneurship program at a local high school, and was President of Women In Development/Gender and Development, dedicated to advancing economic and educational opportunity for women and girls. She continued her work in economic development as an AmeriCorps VISTA volunteer in Nashville, Tennessee. There she assisted a startup non-profit in developing an asset building program to promote educational and economic empowerment for young people in Nashville’s largest public housing project. Shenna is passionate about the environment and science. She worked as a research assistant for several summers during high school and college at the Mount Desert Island Biological Laboratory. She worked for the campus recycling program at Middlebury College, and today she serves on the Manchester Conservation Commission. Shenna is a leader in women’s rights and reproductive freedom. 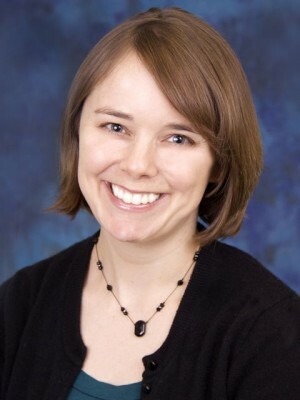 She has been recognized for her work to advance women’s health and reproductive choice by awards from the University of Maine Women’s Studies Department, Mabel Wadsworth Women’s Health Center, the American Association of University Women, the Frances Perkins Center and the Maine Democratic Party. “I feel a deep sense of gratitude for the opportunities I have had at the ACLU for over a decade, both in my two years at the Washington Legislative Office and especially in my last eight years home in Maine with all of you. Together, we were the first state in the country to reject REAL ID. Together, we stood up against warrantless surveillance of our telephone and email communications in 2007, before most people were even thinking about it. This year, we were one of only two states in the country to pass warrant requirements for surveillance of our cellphone communications. Our work to reduce solitary confinement in Maine’s prisons served as a model for other states, and we submitted testimony to Congress and the Inter-American Commission on Human Rights about it. We co-chaired the successful statewide campaign to restore same-day voter registration. We stopped literally hundreds of bad ideas from ever becoming law. And of course, we won marriage for all loving, committed couples in Maine. Shenna recently married longtime beau Brandon Baldwin, Director of the Maine Attorney General’s Civil Rights Team Project. They reside in Manchester. Her campaign website is already up and running, with links to Facebook and Twitter . She plans to launch her campaign officially on Oct. 23 at events in Ellsworth and Portland. 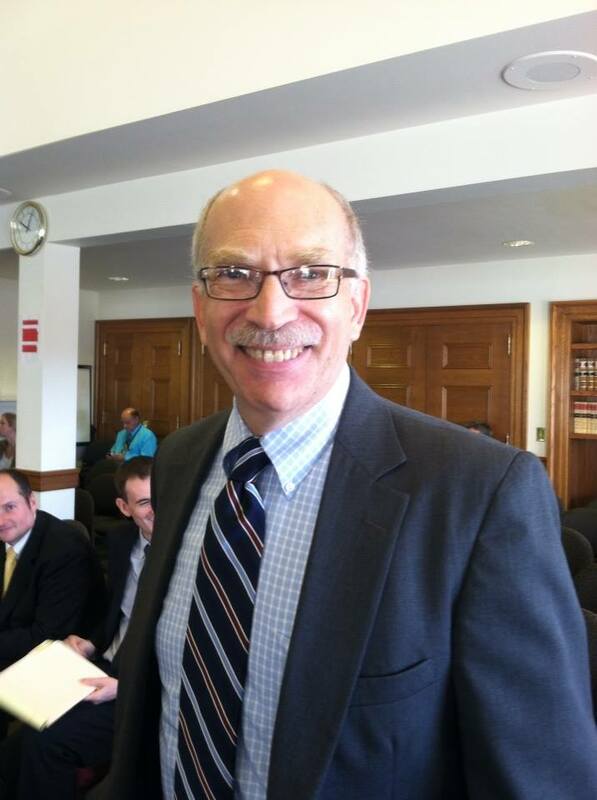 As part of the biennial FY ’14-15 budget bill enacted in June that called for the Governor’s newly formed Office of Policy and Management department with finding $33,750,000 in cuts, OPM Director Richard Rosen presented a 115 page report before Appropriations and Financial Affairs (AFA) last week. This is the first report by Rosen to the committee. $1 million in the closure of the Maine Revenue Services’ Houlton office (Note: This closure has already occurred, resulting in 12 jobs lost). $9.6 million in administrative expenses in cuts to education. Nearly half a million dollars in HeadStart funding. $1 million cut to vaccines for children and cuts to the state’s reimbursement to towns for General Assistance for struggling families. $1 million in innovative technology investments at Maine Technology Institute. -$1.1 million by reducing overtime. -$800k by cutting the Prisoner Boarding Account. -Allowing prisoners with 18 months left on their sentences, as opposed to current 12 months, to participate in work-release programs, creating an additional $85k in revenue. -Privatizing DOC’s kitchen staff, saving $374k. Elimination of more than a dozen inactive state boards and commissions. Negligible savings. As required by the budget, $11 million of the proposed cuts would occur in fiscal year 2014 and do not require the approval of the Legislature. The remainder of the proposed cuts would occur in 2015 and would need to be approved by lawmakers when the Legislature reconvenes in January. A special ceremony was hosted by Governor Paul LePage last week in his Cabinet Room at the State House, highlighting domestic violence awareness, supporting victims and honoring advocates who dedicate themselves to eradicating the violence. The event marked the beginning of Domestic Violence Awareness Month and was attended by a number of state and local officials, law enforcement representatives, business and community leaders and victims’ advocacy groups, including Maine Coalition to End Domestic Violence (MCEDV) and Maine Chapter of Parents of Murdered Children. “Domestic violence takes the lives of too many every year here in Maine. The physical violence alone is heart-wrenching. However, the emotional scars from domestic violence are lasting as well. The Governor took the opportunity to announce that he has directed $10,000 from his contingency fund to help pay for the completion of the Maine Murder Victims’ Memorial. Ground was broken in late September for the monument at Catholic Holy Family Cemetery in Augusta. The Memorial, an effort of the Maine Chapter of Parents of Murdered Children, will have the names of 400 to 500 Maine murder victims inscribed in black granite tablets. In July, LePage directed $100,000 to MCEDV from his contingency fund in the wake of cuts in federal program cuts. Art Jette, director of the Maine Chapter of Parents of Murdered Children, addresses those assembled at event hosted by Governor LePage. Arthur Jette, director of the Maine Chapter of Parents of Murdered Children, said the funds are a blessing and a tribute to every Maine family who has encountered the devastation that domestic violence brings with it. To locate your local Domestic Violence Resource Center, call the Statewide Helpline at 1-866-834-HELP (4357) or visit www.mcedv.org. Introducing New & Improved Maine State Senate Site! Long overdue and looks terrific- well done and kudos to the many talented people who took on this task. Direct link to site here; the page is also added to our “Gov’t/Politics” tab above. Paul: Do you have a second? McConnell: I’m all wired up here. Um. Paul: I just did CNN. I just go over and over again, “We’re willing to compromise; we’re willing to negotiate- I think- I don’t think they poll tested ‘we won’t negotiate’. I think it’s awful for them to say that, over and over again. Paul: I think if we keep saying ‘we wanted to defund it; we fought for that and now we’re willing to compromise on this’… I think they can’t- I mean we’re gonna- I think- well, I know we don’t want to be here, but we’re gonna win this, I think.